can't hear any of mine over the surf. Just loosen the drag. But it is very handy when you need to work with your line such as tangles, grass on line, tying hooks etc. I lke having one. On Hatteras, where we can drive on the beach, when I stop to fish I police the area around my truck for any litter. now that hits close to the truth. Course they are chinese kids now. Palomar or improved clinch knot for tying hooks? Blues could show up in april. 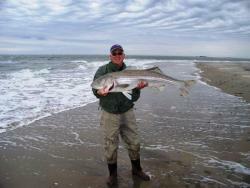 Spanish are a summer fish Talking about Avon to Ocracoke. Further South the more chance of warmer water. Spanish still not likely. I understand your doubt. But I know the knot is good. I believe it is the spinning rod guides and the way the knot goes through. I use the same albright or alberto knot on my conventional reels and have never had this issue of snapped off rigs, when casting anywhere from 2oz to 8oz with my different rods. But that FG knot does seem to spread out smooth, So will field test it in April.. Also might try a bigger top guide if that dosen't work. Will be intresting to see how it works out. By the way Iam using 20lb suffix 832 tied to 20lb flourocarbon. The 20lb suffix is the size of 8lb mono. the knot is tiny. Thanks for all the replies they are good fuel for thought. The reason I am trying the FG is because no matter how small I tied the Alberto knot it catches on the spinning rod guide, and I have break offs with my 2oz lures. It has to be something about the coils and how they react with the guides. Will give a update on if this happens with the FG. Ten day fishing trip starts April first. I just learned the FG knot. It is something worth learning. There is a utube video by a guy that shows you how to tie it without using a triangle method or having to keep the line braid to rod tight. Find that one. swivels tend to last a long time unless you lose the whole rig. So I buy the Spros cause they are small. how are they different from a popping cork? Been around a guy like that. Your niceness is a sign of weakness to him. It's like a wolf preying on a rabbit. Move on and don't be tempted to fish or be around him.